In the official hierarchy, the Chief Justice of India ranks just below the President, Vice President, Prime Minister and Governors, certainly way higher than cabinet ministers or heads of political parties. Not, however, if it is a BJP-ruled state and the BJP President is in town, as Chief Justice Ranjan Gogoi discovered while on a visit to Guwahati’s famed Kamakhya temple over Durga Puja. The Chief Justice and his wife were forced to wait since another VIP, Amit Shah, was also paying homage at the same time, accompanied by Assam Chief Minister Sarbananda Sonowal. Top police officers who were present gave Shah priority, forcing Gogoi to delay his entry to the temple and pay homage along with the general population. Clearly, the chief minister had played a role in getting Shah to jump the queue ahead of the Chief Justice, prov­ing that politics and religion are becoming inseparable. Gogoi was not going to take the insult lying down. He lodged a protest with the seniormost police officer at the spot, leaving Shah and Sonowal holding the can for a serious protocol lapse. The result was that three police officers in charge of crowd control were suspended for the “protocol and security lapses” that caused inconvenience to the Chief Justice. One of them, additional deputy commissioner, Pulak Mahanta, has been accused of “referring to the Chief Justice in a disrespectful manner”, according to an official note. 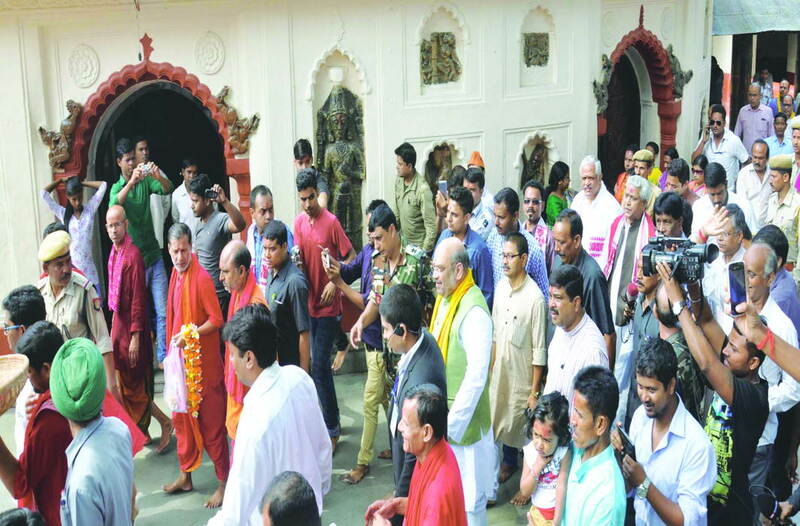 Reporters present at the temple say that a large crowd had been collected to receive—and impress—Amit Shah, which is why the arrival of the Chief Justice was given short shrift and he was forced to wait along with his wife. The Rafale deal and the presence of Anil Ambani in Paris when the agreement was being signed has become a politically sensitive matter so much so that even when the Central Information Commission (CIC) ordered the Ministry of External Affairs recently to disclose the names of private individuals who had accompanied Prime Minister Narendra Modi on foreign tours from 2014-15 onwards, the order was refused. The ministry only provided information regarding mediapersons who accompanied the prime minister abroad, which was already public knowledge. By violating the CIC order, serious questions arise about the government’s claims of creating a transparent system. The foreign ministry’s deputy chief of protocol and public information officer Mayank Singh wrote in the reply: “The information sought is extremely sensitive. If this information is disclosed, it will have an impact on India’s sovereignty and integrity as also on the country’s security, and strategic, scientific and economic interests. Bec­ause of this, a person’s life and physical security can be put in danger. Therefore, this information cannot be disclosed under Section 8 (1)(a) and (c) of the RTI Act, 2005.” The CIC had responded to an RTI filed by Karabi Das who had sought information about the expenditure on foreign tours Modi undertook in 2015-16 and 2016-17 along with the details of individuals who accompanied him on these trips. When the information was not provided, the applicant approached the CIC. While a storm rages inside and around the CBI and the open feud between its top two officers, Alok Verma and his number two, Rakesh Asthana, it has led to some bizarre consequences. One is the appearance of an old video featuring Asthana. Largely self-promotional, it features inspirational Indians from the past including Subhas Chandra Bose, Sardar Patel and Vivekananda and lists their contributions to nation-building before close-ups emerge of the beribboned chest of a man in police uniform, the focus being on his medals. The video suggests he is also worthy of being part of the illustrious list. The camera then moves to Asthana’s face. The video praises his diligence, honesty and dedication to duty. The clip was uploaded to the YouTube channel in April 2018, when he had aleady been given lateral entry into the CBI by the government with the obvious intent that he would take over the top job. In that context, the “promotional” video acquires loaded meaning. Varun Gandhi, son of Union minister Maneka Gandhi, and a BJP MP, has been sidelined for quite some time in the party. Partly, it is to do with his continuing friendly relations with his cousins, Rahul and Priyanka, and also because he speaks quite frankly on issues, even if it means being critical of the BJP-led government at the Centre. Like his speech rec­ently during a college function in his constituency of Sultanpur, where he spoke about how he was given a whack on the wrist by the PMO for raising objections to MPs constantly demanding a raise in their salaries. His exact words were: “I repeatedly raise my voice about the increase in salaries of MPs and not giving details of their assets. Employees of every sector get an increase in their wages based on hard work and honesty. But in the last 10 years, MPs have increased their salaries seven times just by raising their hands. When I raised this issue once, I received a call from the PMO asking, why are you increasing our troubles?” Varun did not reveal the identity of the person who called, but it adds another minus mark to his political CV as far as the BJP is concerned. A series of applications filed under the RTI Act have showed how Public Sector Undertakings are bankrolling the BJP’s events and promotional schemes. The RTI response revealed that PSUs have organised approximately 575 events, costing nearly Rs 82 crore, to commemorate the completion of three years of the Bharatiya Janata Party (BJP) government at the Centre through the “Sabka Saath, Sabka Vikas Sammelan” (SSSVS). Replies submitted by the PSUs in response to the RTI said that government (public) money was spent on what were essentially party events. The PSUs were asked to disclose the background of the schemes and how and why they spent public money on them. In a reply sent in May 2017, Gas Authority of India Limited (GAIL) stated that a meeting was convened by the minister of state in charge of petroleum and natural gas on May 18, 2017 at his residential office, which was attended by chairmen and managing directors and directors of oil PSUs like GAIL, ONGC, IOCL, OIL, BPCL, HPCL, NRL, CPCL, etc. The GAIL response also noted that “during deliberations, it was decided by the MoP&NG that all the oil PSUs would carry out various events on the subject theme in 227 districts all over the country out of the 583 districts identified for the purpose.” As for the remaining 356 districts, it was stated that they will be “taken care of by other PSUs in the ministries of power, coal, mining, aviation, shipping, tele­communications, chemicals and fertilisers, urban development, information and broadcasting, etc”. GAIL was advised to conduct such events in 14 districts and to “bear the expenditure” in respect to the additional 16 districts. The PSU’s reply also revealed that during another meeting held four days later on May 22, the joint secretary in the MoP&NG had indicated that the cost for each event would be between Rs 10-15 lakh, except the event at Varanasi, “which may likely incur Rs 50 lakh considering Hon’ble PM’s constituency and likely visit of Cabinet Ministers for the event”. News travels fast, but when it is fake, it travels even faster. The ongoing tussle in Sabarimala between the pro and anti-women’s entry lobbies has seen fake news factories on both sides working overtime, but for sheer brazenness, the rightwingers take the mithai. A WhatsApp message that went viral in Kerala showed physicist Stephen Hawking, who passed away in March this year, in his familiar wheelchair with a message that read: “This is what happened to the Supreme Court judge who pronounced the verdict allowing women into Sabarimala.” Even those without an idea of who Hawking was but nevertheless blessed with some intelligence would have been prompted to ask: “What happened to the other three judges?” It may be recalled that in the five-judge bench that decided by majority for women’s entry into the temple, Justice Indu Malhotra was the only dissenting voice. Last week, as the temple opened for its annual pilgrimage season and women assembled to make the historic trek up the hill, there were rumours that Trupti Desai, the feisty woman who fought for gender equality in Maharashtra’s villages, was on her way to Sabarimala. 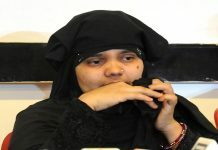 The rumours were triggered by an interview she had given in which Trupti had said she would like to visit the temple. Soon, police were put on red alert and a picture that went viral on social media showed CPI(M) boss Sitaram Yechury hugging a woman who was sought to be passed off as Trupti. It was actually a three-year-old picture of Yechury with activist Teesta Setalvad at a Mumbai rally.